Gold ingots with Standard Weight of 1 kg and fineness >= 999.9 from SGE certified gold producers or producers accredited by London Bullion Market Association (LBMA). As with most things in China, large is the operative word. This is particularly true of the Chinese gold market. China is the largest gold producer in the world, producing an estimated 450 tonnes of gold mining output in 2015, nearly as much as the next two largest producers combined (Australia and Russia). China is also the largest gold importers in the world based on amalgamated import statistics. China’s Shanghai Gold Exchange is the largest physical gold exchange in the world, with the highest physical turnover and largest physical withdrawals of any gold exchange in the world. Total gold trading on the Shanghai Gold Exchange (SGE) reached a mammoth 17,033 tonnes in 2015, up 84% from gold trading volume of 9,243 tonnes in 2014. Physical gold withdrawals from the SGE totalled 2,596 tonnes in 2015. China’s state-controlled bank ICBC, which is extensively involved in the gold industry, is the largest bank in the world. The Chinese central bank, the Peoples bank of China (PBoC), can also boast the fastest growing official gold reserves in the world. As the Chinese Government and the PBoC continue to embark on the internationalisation of the Renminbi (RMB), for trade payments, outward investment, and ultimately as a reserve currency, the onshore and offshore trading of gold through the Shanghai Free Trade Zone, and the International Board of the Shanghai Gold Exchange should take on added significance, and allow China to acquire some pricing power in determining the international gold price. This is why the upcoming Shanghai Gold Fix is being eagerly awaited, although expectations about its impact are undoubtedly a case of too high too soon. An understanding of the contemporary official Chinese perspective on gold requires a brief understanding of China’s political and monetary system during the 20th century and the emergence of the communist Peoples Republic of China (PRC). While many other economies were on a gold standard during the early 20th century, the then Republic of China, or more practically the financial centre of Shanghai, employed a silver standard, and the region remained on this silver standard until November 1935, with the Shanghai tael (equal to 518.512 grains of silver) used as the accepted silver measurement unit until 1933. During this period, silver coinage (and gold coinage) circulated freely as money within China. Even after the departure from the silver standard, both monetary metals continued to be circulated as money, and during the 1930s and 1940s, Shanghai was the largest gold trading centre in East Asia. From 1927, a low-key civil war was fought between the then dominant and ruling political party of the Kuomintang (KMT) (Nationalist Party), and the Communist Party of China (CPC). This inter-party war took a back seat during the period of full-scale war that took place between the Republic of China and the Empire of Japan which started in 1937 and ended in August 1945 (part of WWII). After the Japanese were defeated in 1945, the Chinese civil war again came to the fore and lasted 4 more years, however, it was not obvious at that time that the CPC would be victorious. For example, in 1946, the International Monetary Fund (IMF) had even authorised the addition of the Central Bank of China in Shanghai as one of the IMF’s 5 designated gold depositories within the Bretton Woods monetary system. In 1949, when it became fully obvious that the Communists had defeated the KMT, the IMF then ‘temporarily’ removed Shanghai from the gold depository list. See BullionStar blog “The IMF’s Gold Depositories – Part 2, Nagpur and Shanghai, the Indian and Chinese connections” for more details. By 1949, the defeated KMT had fled to Taiwan (with the nation’s official gold reserves), and the CPC then established the Peoples Republic of China (PRC) in 1949. As a centrally controlling governing structure, one of the PRC’s first initiatives was a ban on private ownership of both gold and silver, and a seizure of control over the banking system to form the Peoples Bank of China(PBoC), as well as a seizure of the economy’s financial markets (including gold and silver trading). In June 1983, the PRC published ‘Regulations on the control of gold and silver’, which specified detailed controls (35 articles long) on managing the precious metals markets, covering purchases and sales of gold and silver, imports and exports of silver, and controls over gold and silversmiths in China. These regulations were implemented by a set of PBoC rules published in January 1984 –“Detailed rules for the implementation of the regulations on the control of gold and silver of the People’s Republic of China”. Although various periods of economic reforms were implemented in China beginning in 1978, and continued with large-scale privatisations in the late 1990s, it was only in March 2001 that the PBoC announced an end to its monopoly on management of the gold market. This was part of China’s broader gold market liberalisation strategy, which was stated in its 10th Five Year plan of 2001. The gold market liberalisation strategy was first referenced in the World Gold Council organised “2000 China Gold Economic Forum” held in Beijing in October 2000. This gold market liberalisation, after over 50 years of State control, included a move from State monopoly on the gold market to a free-market gold sector, the proposal of a ‘gold exchange’ in Shanghai, the removal of licensing requirements for gold market participants (including encouraging the retail public to participate in the domestic gold market), and the gradual abolition of gold import and export controls. In 2001, the China Gold Association (CGA) was launched by the PRC and the State Economic and Trade Commission. A very early version of the CGA website from March 2002 can be seen here. In October 2002, the Shanghai Gold Exchange (SGE) was officially launched, having been in a test phase for the previous 11 months. At launch there were 108 members authorised to trade gold on the Exchange. By 2004, private citizens in China were again allowed to transact and possess gold bullion. In 2008, the first Chinese gold futures contract was launched by the Shanghai Futures Exchange (SHFE). Finally, in September 2014, the SGE launched the Shanghai International Gold Exchange (SGEI). China’s four large state-controlled banks are critical components of the Chinese gold market. These four banks are the Industrial and Commercial Bank of China (ICBC), Bank of China (BoC), China Construction Bank (CCB), and Agricultural Bank of China (ABC).Therefore, before looking at the Chinese gold market, it’s important to be aware of the identities and backgrounds of these banking entities. These four banks were all previously state-owned but each went through transformations in the 2000s whereby they became joint-stock companies and their equity was then listed on both the Hong Kong and Shanghai stock markets. However, the PRC still maintains controlling interests in these banks, mainly through a Beijing headquartered company called ‘Central Huijin Investment Company’. Central Huijin Investment Company was created by China’s State Administration of Foreign Exchange (SAFE) in 2003, and since 2008 has been a fully-owned subsidiary of China’s sovereign wealth fund China Investment Corporation (CIC). CIC is itself owned by the PRC. The sole role of Central Huijin is to invest equity in China’s large state-owned financial enterprises and to represent the wishes of the State Council on the boards of these companies. It’s therefore important to keep in mind the interactions between the PRC, the PBoC, SAFE, CIC and these ‘Big 4’ Chinese banks. Apart from the Big 4 banks, Central Huijin holds equity stakes in other entities such as China Development Bank, China Everbright Bank, China Export & Credit Insurance Corp etc. A full list of Central Huijin’s investments can be seen on its website. Industrial and Commercial Bank of China (ICBC) was incorporated in January 1984. It transformed from a state-owned bank to a state-controlled joint-stock commercial bank in 2005, before becoming dual-listed on the Hong Kong and Shanghai stock exchanges in October 2006. The PRC’s Ministry of Finance is still one of ICBC’s controlling shareholders. Another controlling shareholder is the Central Huijin Investment Company. Bank of China (BoC) was founded in 1912. In 1949, BoC was taken over by the PRC and in 1950 began to be managed by the PBoC, at which point it became a specialised foreign exchange bank. In 1979 BoC was detached from the PBoC, and given responsibility for SAFE, and for China’s wider foreign exchange operations. In 1983, the PBoC became a central bank and SAFE was detached from BoC. BoC then remained a specialised foreign exchange bank with the PBoC providing oversight until 1994 when BoC became a state-owned commercial bank. In 2004, Central Huijin Investment Company took a controlling interest in BoC, and in July 2006, BoC was dual listed on the Hong Kong and Shanghai stock exchanges. The predecessor of China Construction Bank (CCB) was established in 1954 as a state-owned bank, to specialise in funding Chinese construction and infrastructure projects. CCB converted from a state-owned bank to a joint-stock commercial bank in 2004 through the participation of Central Huijin Investment Company, and part of the bank was spun off into another entity called Jianyin. CCB was listed first on the Hong Kong Stock Exchange in 2005, and subsequently listed on the Shanghai Stock Exchange in 2007. Agricultural Bank of China (ABC) was founded in 1951 as a specialist bank for the Chinese agricultural sector. At that time it was known as the Agricultural Cooperative Bank. ABC transformed from a state-owned bank to a state controlled joint-stock company in 2009, and became dual listed on the Hong Kong and Shanghai stock exchanges in 2010. Bank of Communications (BoCom) is a Shanghai headquartered nationwide Chinese commercial bank. Although its outside of the Big 4 list, BoCom is noteworthy in that its very involved in the Chinese gold market. BoCom is state-controlled and it also floated on the Hong Kong stock market (2005) and Shanghai stock market (2007) as a joint-stock company. Note that until 1978, PBoC was the only bank in China, and it engaged in central banking and commercial banking. In 1979, Bank of China and CCB were split off from the PBoC. Agricultural Bank of China separated out into a state owned entity in the late 1970s. By 1983, all commercial banking operations had been fully split off from PBoC. What remained of the PBoC was then officially designated by the PRC in 1983 as the Chinese Central Bank. Note that ICBC was only incorporated on 1st January 1984, after the PBoC became the central bank. 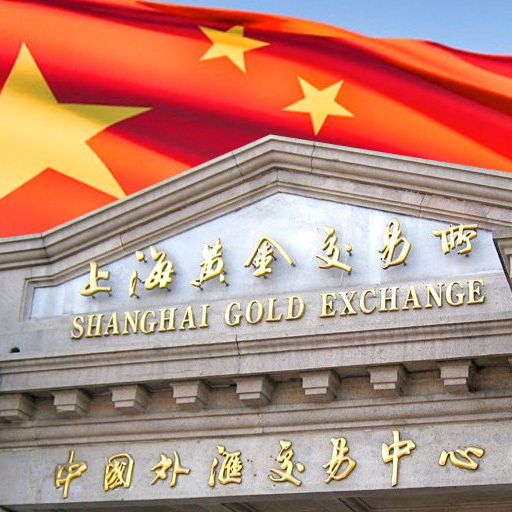 The Shanghai Gold Exchange(SGE) was formally launched on 31 October 2002 by the Peoples Bank of China (PBoC), and since establishment, the Exchange has been supervised by the PBoC. At launch date, the Chinese Government and PBoC transitioned some of their gold market management functions to the SGE. All SGE trading platforms are electronic. The SGE offers spot and deferred trading, as well as forwards, options and leasing, and also runs the Exchanges’ central market clearing process for all of the above products, and the delivery, transfer, and vaulting services for the gold flowing into, out of, and held in the Exchanges’ vaults. The Exchange’s building is located at No.99 Middle Henan Road in the central Huangpu District of Shanghai. The SGE is the world’s largest physical gold exchange. In 2014, 18,500 tonnes of physical gold were traded on the Exchange. The SGE categorises its members as domestic or international. The Exchange has over 180 domestic members representing approximately 10,000 corporate customers and approximately 8.3 million individual customers. Within the domestic membership category, ‘Financial Members’ (institutions) are authorised by the Exchange to engage in brokerage transactions and proprietary trading. There are approximately 36 of these institutions. Most of the other institutional members are ‘General Members’ (129 members) that are permitted to only engage in proprietary trading. There is also a domestic membership category of ‘Special Member’ representing 10 members, and 2 ‘Proprietary members’. Domestic members can transfer their membership to other entities. Some of the initial foreign banks that became domestic members of the SGE in 2008-09 were HSBC, Standard Chartered, ANZ, Scotia, and Credit Suisse. In 2014 the Chinese authorities and the SGE embarked on the launch of an International Board of the SGE as part of China’s ongoing internationalisation of its gold market and currency market. The International Board offers ‘international’ members access to Renminbi trading of gold on the SGE and International Board certified precious metals vault located in the Shanghai Free Trade Zone. The China (Shanghai) Pilot Free Trade Zone, commonly called Shanghai Free Trade Zone, Shanghai FTZ, or just SHFZT, was established in September 2013. At establishment, it was the first FTZ in China, but in 2015, three further FTZs have been launched in Tianjin (near Beijing), Fujian (near Taiwan), and Guangdong (near Hong Kong and Macau). Initially the FTZ consisted of a ‘FTZ Bonded Area’ east of downtown Shanghai which encompassed an area around Pudong International Airport, the Yangshan area including Yangshan port and harbour, and the Waigaoqiao free trade zone and logistics park. This area comprises 28.78 square kilometres. In early 2015, the Chinese Government substantially expanded the Shanghai FTZ to include the Lujiazui financial area, the Zhangjiang high tech park area, and the Jinqiao export zone, making the entire Shanghai FTZ 102.72 square kilometres. The Shanghai International Gold Exchange, abbreviated as SGEI, and also known as simply ‘the International Board’ was launched in September 2014. Shanghai International Gold Exchange Co. Limited (SGEI) is a wholly-owned subsidiary of the Shanghai Gold Exchange. The SGEI is located within the Shanghai Pilot Free Trade Zone and its office address is 42/F, Bank of China Tower, 200 Yincheng Road Central, in the Pudong District of Shanghai, which is across the river Huangpu in the financial district to the east of the SGE building. The International Board certified precious metals vault is also located within the FTZ, which, for SGEI members, simplifies moving gold into and out of China, since customs declarations are speedier and less erroneous. Members of the SGEI (i.e. International members of the SGE, can be either ‘Full Members’ (called Type A members), Proprietary Members (called Type B members), or ‘Special International Members’. Full members are authorised to engage in proprietary trading and brokerage, whereas proprietary members, as the name suggest, can only engage in prop trading. Since the Shanghai International Gold Exchange is known as the ‘International Board’ of the SGE, the original non-International SGE is now sometimes referred to as the ‘Main Board’. SGE consists of two specific trading markets, namely a “Price Matching Market” and a “Price Asking Market”. The Price asking market cover a wholesale OTC market and a Leasing Market. SGE trading takes place on an electronic trading platform where buy and sell orders are matched, hence the name ‘Price Matching Market’. For gold, the Exchange offers physical trading (T+ 0) and trading with deferred settlement (T + D), where T = Trade Date, and D = Number of Days deferred. The 16 SGE/SGEI products referred to below are all on the ‘Price Matching Market’. The SGE’s ‘physical trading’ is spot trading with same day settlement or T+0. With physical trading and intra-day settlement, buyers must hold the full cash value of an order in their accounts, and the seller must hold the required physical gold in their accounts. Buyers can re-sell the purchased gold on the same day and withdraw or transfer it the following day. Sellers may use up to 90% of same day sales proceeds within subsequent trades. The SGE also offers deferred trading on margin, which is simply margin trading with an in-built option on delivery dates. With delivery dates for physical metal unknown, the SGE uses a mechanism of deferred interest and what it calls a ‘delivery equaliser’, to cover undelivered lots. For example, if a seller decides to defer or postpone delivery of a transaction, deferred interest is charged on the undelivered contract lots. Ultimately, the delivery has to happen, and another participant can step in as the ‘Delivery Equaliser’ to deliver, and this entity then receives the accumulated deferred interest. Products on the SGE ‘Price Asking Market’ consist of Spot, Forwards and Swaps (PAu99.99 PAu99.95 iPAu9999 iPAu99.5 iPAu100g), Options (OAu9999 OAu9995), and Interbank Leasing(LAu99.95 LAu99.9 iLAu9999 iLAu99.5 iLAu100g). The SGE facilitates gold leasing, gold pledging, and gold location swaps through its transfer system. Members of the International Board can lease, pledge and swap deliverable product gold between each other and also with those domestic members of the SGE that have a gold import license. Lending by International Board members to domestic members who do not have gold import licenses requires SGC approval. An SGE account consists of two components, a margin account and a bullion account, but they are really two parts of the same account, one part for cash and the other part for gold bullion. Any Chinese individual can open ‘one’, and only one, SGE account to transact gold from. In the margin account, a customer holds a trading margin and a clearing deposit. SGE accounts are opened at participating Chinese banks. The Chinese public can even trade gold at the SGE using a mobile phone app. See BullionStar blog “In China Everyone Can Buy Gold At The SGE” for details. The PBoC obliges domestic gold producers to sell all of their Standard gold via the SGE. Domestic gold producers could sell non-Standard gold off the SGE in a less processed form such as doré or ore bars, however nearly all Chinese domestic gold mining output is refined into Standard gold and sold through the SGE. This is because gold mines have a nbumber of incentives to refine their gold output to this ‘Standard’. Firstly, Standard gold traded on the SGE has the deepest liquidity, so domestic gold mining companies will invariably direct that their output be converted into standard gold form (either 50g, 100g, 1kg, 3kgs, 12.5kgs bars of 9999, 99995, 999 or 995 fineness) so as to access this deep liquidity. A further incentive is that Standard gold sold on the SGE is VAT exempt while Standard gold sold away from the SGE is not VAT exempt. Scrap gold in China is not obliged to be sold through the SGE. But because SGE standard gold is VAT exempt, gold refineries again have an incentive to convert scrap into Standard gold bars and trade these bars through the SGE. In a similar way to the LBMA’s good delivery gold ‘chain of integrity’ in London, Standard gold bars withdrawn from the SGE vault network is not accepted back into the SGE vault network as its provenance cannot be determined. Standard gold that has been withdrawn from the SGE would first have to be remelted, recast and assayed by an SGE approved gold refinery before being accepted back into the SGE vault network. The SGE offers 16 precious metals contracts, 12 of which are on gold, 3 on silver and 1 on platinum. Of the 12 gold contracts, 8 are for physical delivery and 4 for deferred delivery 9or margin trading). Of the physical contracts, 5 are on the Main Board and 3 are on the International Board. All SGE and SGEI contracts are priced in RMB. These contracts are traded in onshore Renminbi (CNY). The Au99.99 and Au99.95 were the first contracts to be offered on the SGE. Both were launched in October 2002. This was followed by the launch of the retail Au50g contract in June 2004. Next launched was the Au100g in December 2006. The Au99.5 contract, for large Good Delivery bars, was launched in December 2013. For trade settlement, the SGE has certified 18 settlement banks for currency clearing. These contracts are traded in offshore Renminbi (CNH). The three contracts on the International Board, iAu100g, iAu99.99 and iAu99.5 were launched in September 2014. The SGE refers to gold contracts for deferred delivery as T + D contracts, where D = number of days to delivery. mAu stands for ‘mini’, i.e. 100 grams trading unit. Two of these contracts only require deferred interest to be paid once per year and are labelled as T + N contracts. In SGE deferred trading, trading margin is variable but, for example, was 7% during 2015. The margin is paid to the Exchange as the central clearing party. All SGE trading and delivery rules are detailed on the Exchange’s website. The SGEI uses an electronic trading platform known at the International Trading System. The SGEI has certified 7 Settlement Banks for currency clearing. These banks are ICBC, ABC, BOC, CCB, BOCOM, CMB, and SPD Bank. In January 2016, the SGE and China Foreign Exchange Trade System launched interbank (bi-lateral) gold trading among 16 mostly Chinese banks, 10 of which were deemed first tier market-makers, namely, ICBC, CCB, BoC, ABC, BoCom, China Merchants Bank, China CITIC Bank, Bank of Ningbo, Industrial Bank Co, and the Shanghai branch of Australia and New Zealand Banking Corp (ANZ) , with another 6 second-tier smaller Chinese bank market making participants. The aim of the launch is to enhance gold trading liquidity in the Chinese gold market. With interbank gold trading, participating banks are able to buy and sell gold between each other directly, and are not obliged to trade solely with the SGE as counterparty, as was the case previously. Foreign bank members of the SGEI include HSBC, Standard Chartered, Scotiabank, Goldman Sachs, UBS, ICBC Standard Bank, Natixis, Trafigura Pte, Mitsubishi (Japan), Bank of Taiwan, Bank of China (Hong Kong), Bank of Communications (Hong Kong), Australia and New Zealand Bank (ANZ) (FTZ Branch), Bank of Taiwan. Non Chinese gold refiners represented are Metalor, Heraeus (Hong Kong), PAMP (+ MKS). The Chinese Gold & Silver Exchange Society (of Hong Kong) is an exchange members of the SGE and the SGEI. Other non-Chinese entity members include Thai gold refiner and wholesaler through its Singapore branch, YLG Bullion Singapore Pte, and from Dubai, Kaloti Jewellery International DMCC. Kaloti is a Limited Member. Many Chinese banks are members of the SGEI, represented by their Shangahi Pilot FTZ Branch. Thes ebanks include ICBC, Bank of China, China Construction Bank, Bank of Communications, Agricultural Bank of China, China Minsheng Bank, China Merchants Bank, China Everbright Bank, Shanghai Pudong Development Bank, Bank of Shanghai, Industrial Bank, China CITIC Bank, and Pingan Bank. Note that Deutsche Bank and JP Morgan Chase are not listed as members of the SGEI despite the SGE having earlier reported that they were. Around the launch date of the SGEI in 2014, the SGE also mentioned that Citibank, Société Générale, Valcambi, and the Perth Mint were potential future members of the International Board, but as of yet, they are not. To trade on SGEI, a member or its customer needs to set up a free trade zone account (FT account) in offshore RMB (CNH) with a clearing bank. On the SGE Main Board, trading in the deferred contracts in highest, led by the Au (T + D) contract. In the spot contracts, the Au9999 contract consistently sees the highest trading volumes. Of the International Board contracts, the iAu9999 contract records the highest trading volumes. Trading volumes in kgs reported by the SGE are bilateral so these need to be halved to avoid double counting. Gold supply for any country can be captured by the formula: Gold Supply = Gold from Mining + Scrap recycling + Gold Imported. All ‘Standard gold’ from Chinese gold mining companies has to be sold on the SGE. Likewise, all ‘Standard’ gold imported into China by the banks with import licenses has to be sold on the SGE. These are PRC / PBoC rules. Finally, most gold from scrap sources sold by Chinese refineries is sold through the SGE in the form of ‘Standard’ bars because the SGE is VAT free and the market is most liquid. Therefore, in China, the addition of Mining + Scrap + Imports is a good proxy of total Chinese gold supply. In other words, the widest measure of supply (mine supply, imports, scrap/recycling) = the widest measure of demand (SGE withdrawals). See BullionStar blog “The Mechanics Of The Chinese Domestic Gold Market” for further details. For 2015, SGE gold withdrawals totalled a massive 2,596 tonnes, up from 2,102 tonnes in 2014 and 2,181 tonnes in 2013. This 2,596 tonne withdrawal is 81% of 2105 world gold mining output and shows that China is consuming far more gold than the mainstream media reports claim. Up until the end of 2015, the SGE published weekly and YTD gold withdrawal data (in Chinese), and so annual gold withdrawal data from the SGE was readily discernible. From the beginning of 2016, this withdrawal data appears to only be published monthly (in Chinese) due to some SGE procedural changes. See BullionStar blog “SGE Continues To Publish Withdrawals Figures?” for details. Some gold consultancies, such as the World Gold Council, calculate an annual figure for Chinese gold demand that is just based on retail demand. For 2015, the World Gold Council estimates that Chinese gold demand was 984 tonnes. This substantially understates the true figure because it does not take into account net investment by corporate and individual customers of the SGE withdrawing gold directly from the vaults of the Exchange. The Shanghai Gold Exchange has certified 55 vaults for gold storage nationwide across 36 Chinese cities, and 3 certified vaults for silver, making 58 vaults in total. The vaults are in locations proximate to either gold refineries or jewelley/consumer centres. The SGE International Board certified vault located in the Shanghai Free Trade Zone is managed by Bank of Communications (BOCOM), and operates under the supervision of FTZ Customs staff. Based on the structure of the FTZ, gold imported into the SGEI vault remains outside China, since the FTZ is considered to be external to China. This vault has a capacity of 1500 tonnes of gold and other precious metals.The SGEI – BOCOM vault is located at “20 Wanrong 1st Road, Zhabei District, Shanghai”. Note that ICBC is planning to build a second SGEI certified vault in the Shanghai free trade zone. In turn, the International Board (IB) Certified Vault, run by BoCom, has appointed Shanghai Huanyu Customs Broker Ltd as the designated agent for handling SGEI generated physical customs declaration applications in and out of China, and appointed G4S International Logistics (Shanghai) Ltd as designated secure transport operator to deliver gold to and from Shanghai airport and the IB vault. As well as transaction services for gold deliveries and transfers related to Exchange transactions, the SGEI vault also provides segregated safe deposit storage for other customer gold unrelated to Exchange transactions. Any gold that is withdrawn from the SGE vault system must be re-assayed before being accepted back into the SGE system. This allows all gold with the SGE vault system to maintain its chain of integrity. Metal coming into SGE/SGEI vaults is referred to as ‘load-in, and conversely, metal being withdrawn is referred to as ‘load-out’. Only those banks that hold gold import licenses can transfer gold from the SGEI vault to an SGE vault for trading on the SGE Main Board market. The Shanghai Futures Exchange (SHFE) has approved 32 designated warehouses in China for delivery of gold for its gold futures contracts. These 32 warehouses are operated by the four large Chinese banks, namely, ICBC, CCB, Bank of China, and BoCom. Malca Amit recently opened a new precious metals vault in Shanghai’s FTZ. Brinks has a substantial presence in China’s main gold hubs including China including Shanghai, Shenzhen, and Qingdao. The SGE is increasingly engaging with other major global gold market participants in various collaborative efforts. In July 2015, the London Bullion Market Association and the Shanghai Gold Exchange announced agreement on mutual recognition of the specifications for a 1 kilo gold bar of 9999 fineness. In July 2015, the SGE and the Hong Kong based Chinese Gold & Silver Exchange (CGSE) Society launched the ‘Shanghai – Hong Kong Gold Connect’. After signing a Memorandum of Understanding in November 2014, the SGE announced in July 2015 that it would list bullion products on the CME trading platform, and allow CME members to trade SGE products. This has not yet happened. These listing plans include future reciprocal listing of gold contract products on both exchanges, so that SGE members will in future be able to trade CME listed gold products. Reuters reported in June 2015 that the SGE has been in discussions with the Dubai Gold & Commodities Exchange on a linkup and the creation of “yuan-denominated” gold products listed on Dubai’S DGCX. While this Dubai development has not yet occurred, the DGCX did launch a cash-settled Yuan currency futures contract in late December 2016, which may be a precursor to a yuan-denominated gold product on the DGCX. In 2015, Bank of China and ICBC joined the daily LBMA Gold Price auction as direct participants, although neither was a direct participant when the benchmark was launched in March 2015. In June 2015, ICBC also expressed interest in joining the auction , however it has not yet joined up. This indirect link between the SGE and the London Gold Market through the LBMA Gold Price auction, and the presence of Chinese banks in a daily London gold benchmark auction process should be watched in terms of the SGE planned daily yuan gold fix, scheduled for April 2016. In June 2015, the SGE announced at a LBMA Bullion Market Forum in Shanghai that it planned to launch a “Yuan Gold Fix” in late 2015. On 9 December 2015, the SGE was scheduled to reveal trading details of this Yuan gold fix at the 10th China Gold and Precious Metals Summit in shanghai, however, on 10 December 2015, Reuters reported that the launch would be delayed until April 2016. The yuan gold fix launch is now scheduled for 19 April 2016. In theory, this yuan gold fix should give the Chinese gold market more input into global gold price discovery, and is undoubtedly being pursued by Chinese as part of the Chinese Government’s long-term gold reactivation strategy. The Shanghai Futures Exchange(SHFE) was formed in 1999 through the merger of three existing commodity exchanges, Shanghai Commodity Exchange, Shanghai Metal Exchange and Shanghai Cereals & Oils Exchange. The SHFE is headquartered at 500 Pudian Road in Shanghai and is regulated by the China Securities Regulatory Commission (CSRC). As well as a gold futures contract, the SHFE lists futures on silver, futures on a series of base metals, and contracts on fuel oil and rubber. The SHFE has more than 200 members of SHFE, 80% of which are futures firms. A 2014 ranking of futures exchanges globally by the Futures Industry Association (FIA) put the SHFE as the world’s 9th most active futures exchange, with the SHFE’s 1kg gold futures contract ranked 2nd to that of the CME’s Comex 100oz gold futures contract. There are 2 other active commodity exchanges in China, namely the Zhengzhou Commodity Exchange, and the Dalian Commodity Exchange, which both specialise in agricultural and base metal products, and neither of which lists any precious metals contracts. The SHFE launched a gold futures contract in January 2008, after securing contract approval in September 2007. The contract size of 1kg was decided upon after consultation with the market. The contract’s original trading hours were 9:00am – 11:30am and 1:30pm – 3:00pm. In July 2013, the SHFE also introduced night trading for the gold futures contract (as well as for its silver futures contract.Night trading hours, which the SHFE also calls ‘continuous trading’, spans 9pm until 2:30am the next morning. China’s official gold reserves are held by the People’s Bank of China. The PBoC accumulates its gold reserves from domestic production, secondary domestic scrap sources, purchases in foreign markets, and other transacting in the domestic market. It is thought that the PBoC does not make widespread use of the Shanghai Gold Exchange. From 2009 until July 2015, China’s official national gold reserve figure remained unchanged as the PBoC did not report any updates. From July 2015, the PBoC confirmed that it would now follow the SDDS international reserves reporting template and provide updated gold reserve data to the IMF on a regular basis. At this time, the PBoC also began to value its gold holdings at market value on its balance sheet. Since July 2015, the PBoC has reported monthly increases in its gold reserves each and every month, and added over 100 additional tonne to the August 2015 figure. As of February 2016, the PBoC officially holds over 1,778 tonnes of gold. With the PBoC now announcing regular updates to its official gold holdings, on the surface this could be interpreted as the PBoC actually buying extra gold in the month before it makes the relevant announcement. However, this is not necessarily the case. The PBoC is not the only Chinese State entity authorised to hold gold within the PRC, and other entities such as SAFE, CIC, or even ICBC could theoretically also hold official Chinese gold, and then intermittently make gold transfers to the PBoC. Since these other entities do not publish their gold holdings, its impossible to know. What seems to be more discernible is that the PBoC does not source its gold from the SGE but buys using other routes such as on the international market. See BullionStar blogs “The London Float And PBOC Gold Purchases“, and “PBOC Gold Purchases: Separating Facts from Speculation” which discuss evidence of the PBoC buying gold in the London Gold Market. The China Gold Association (CGA) was founded in 2001 by the then Chinese State Economic and Trade Commission and the Ministry of Civil Affairs. CGA members include gold exploration and production companies, gold refiners and investment companies. The main purpose of the CGA is to promote the development of the Chinese gold market, act as a liaison between the PRC and the industry, foster international cooperation, support scientific research, and promote gold consumption in China. The miner-funded World Gold Council maintain offices in both Shanghai and Beijing. The Shanghai office is located at No. 1717 Nanjing West Road, Wheelock Square, in the Jing’an District, and the Beijing office is at 5/F China Life Tower, No. 16 Chaowai Street, in the Chaoyang District. China is now the world’s largest gold producing country, with (estimated) gold mine output in 2015 reaching 490 tonnes. Although China hosts some large mining companies, the industry is still quite fragmented with over 600 mines nationwide. China National Gold Group Corporation, usually known as China Gold or CNG, is China’s largest gold producing company. CNG is state-owned and state supervised and is a member of the World Gold Council. CNG is essentially an integrated gold sector conglomerate consisting of various operations including Zhongjin Gold, Zhongjin Gold Jewellery, and China Gold International Resources Corporation. Zhongjin Gold is the largest gold mining company in China and has the largest in-ground gold reserves of all Chinese mining companies. Zhongjin Gold Jewellery supplies gold to about 1,600 franchised gold jewellery stores throughout China that sell CNG branded gold bars and other gold investment products. CNG has a 39% stake in China Gold International which owns 2 mines in China. China Gold International is listed on the Toronto Stock Exchange and the Hong Kong Stock Exchange. Other large Chinese gold mining companies include Zijin Mining Group, Shandong Gold Group, Zhaojin Mining, and Hunan Gold. By any measurement, China has a large number of sizeable gold refineries relative to other countries. The identities of these refineries can be established by consulting a number of sources such as the approved gold refinery lists of the SHFE and SGE, as well as the London Bullion Market Association’s (LBMA) good delivery list for gold, and indeed the LBMA’s membership list. ‘Great Wall’ is the only Chinese gold refinery in the above lists that’s an Associate of the LBMA. According to the SGE, additional domestic gold refiners are expected to apply for Good Delivery accreditation from the LBMA. The SGE has approved a vastly larger number of Chinese gold refineries as good delivery. The SGE’s full list is of both domestic refiners and non-Chinese refiners eligible to deliver gold (good delivery) to the Exchange. The full list of domestic gold refiners that have been accredited by the SGE can be viewed in the 2014 Goldbarsworldwide publication from Grendon International Research. This list is taken from the 2013 Shanghai Gold Exchange annual report, and is divided into two specific lists, one with 35 refiners across the country that are accredited to deliver ‘Ingots’ (bars of weights 12.5 kg, 3 kg and 1 kg), and a subset list of 22 refiners (many of which are in the first list), that are accredited to deliver ‘Bars’ (bars of weights 100 g and 50 g). The Chinese Gold Panda coin is produced by Shenzhen Guobao Mint, which is part of China Gold Coin Inc (CGCI), which in turn is owned by the Chinese State. The Chinese Silver Panda is also produced by one of the divisions of CGCI. Only commercial banks with a PBoC gold import license are authorised to import gold into China. Currently, only 15 banks hold this licence, 12 of which are Chinese banks, and the remaining 3 are Chinese branches of foreign banks. Until late 2013, 9 Chinese banks were authorised to import gold into China. In December 2013, HSBC and ANZ, as well as Chinese bank Everbright, also received gold import licences from the PbOC. Standard Chartered was subsequently granted an import license in August 2014. Shanghai Pudong Development Bank and China Merchants Bank also received import licences at that time. All gold imported into China has to be sold through the SGE. All gold imported into China for delivery to the International Board of the SGE must be from accredited refiners on the LBA Good Delivery List. All import deals have to be reported to the PBoC. Each time an authorised gold importer wants to import gold into China, the importer still requires pre-approval from the PBoC. This means that the PBoC is always aware of all planned and potential gold imports into China even before they have even occurred. Any other ‘foreign’ bank with gold to import into China has to use one of the above banks. The foreign bank is required to deposit the gold with the designated license holding bank, which will then handle the sale on the SGE. One proxy for Chinese gold imports is non-monetary gold imports from Hong Kong, although China has been increasingly importing gold directly from other countries since 2014 (such as from the UK and Australia), so this proxy is not as complete as previously. Chinese ‘net imports’ from Hong Kong totalled 862 tonnes in 2015, up from 816 tonnes in 2014, but down from 1158 tonnes in 2013. This drop from 2013 is not surprising given that direct imports from countries rose. A small number of Chinese jewellery companies also hold a gold import license, but only for non-standard gold. In January 2016, the Chinese General Administration of Customs announced that from the beginning of 2016, the importation of gold for industrial purposes would no longer require a PBoC license. 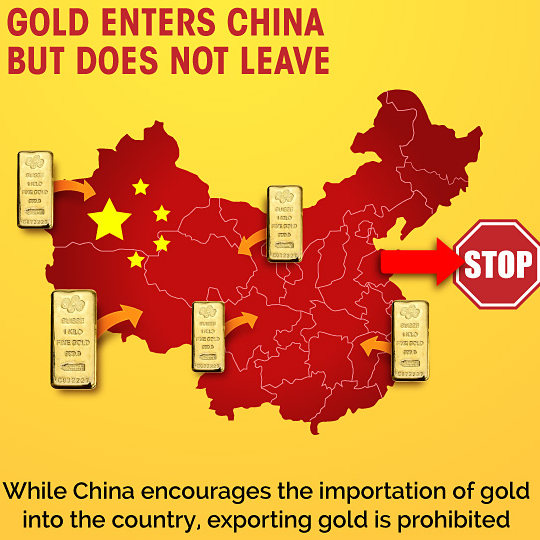 Generally, exporting gold out of the Chinese gold market is prohibited, the main exceptions being processing trades from Free Trade Zones and exports such as Chinese gold coins. Shenzhen, located close to Hong Kong, is the centre of China’s gold jewellery manufacturing sector. The World Gold Council (WGC) and precious metals consultancy GFMS estimate that there are at least 4,000 manufacturers of gold jewellery in Shenzhen, and that the Shenzhen producers fabricated over 700 tonnes of gold jewellery in 2013, 85% of which was for the domestic Chinese market. The WGC estimates that there are over 100,000 retail jewellery stores across China (see “understanding_chinas_gold_market report from the World Gold Council, July 2014) owned by a cross-section of entities from large groups, such as China National Gold Corp, to Hong Kong based jewellery companies such as Chow Tai Fook and also many smaller local operators. According to the World Gold Council, mainland Chinese gold jewellery demand totalled 807 tonnes in 2014. and 783.5 tonnes in 2015. Thousands of Chinese bank branches and jewellers also stock investment grade small gold bars. These bars are 9999 fine, and include kilobars, through 100g and 50g weights down to very small 5g bars, and also bars produced in denominations of the traditional tael weight system. According to the World Gold Council, mainland Chinese investment gold bar (and coin) demand was 166 tonnes in 2014, and 201 tonnes in 2015. “How much are the foreign currency reserves and gold reserves [of these countries]? What is current global annual gold output? What is the annual output of the main gold-producing countries? That the Chinese premier asked such questions at that time should not be surprising since gold was beginning to experience its US orchestrated push out of the international monetary system. What should also not be surprising is that the Chinese play a very long game. Such pertinent Chinese questions in the early 1970s about the gold reserves of major competitor nations, and curiosity about the link between currency and gold, perhaps demonstrates that the PRC has always planned to take gold back into centre-stage of the international monetary system, and that what we are witnessing now with Chinese official (and county-wide) gold purchases, is but an implementation of a plan long decided upon in Beijing many years ago.